Fewer ingredients hit a popularity during a certain season like pumpkin does in fall. Pumpkin pie, pumpkin soup, pumpkin spice lattes all hit a high during this time of year. One of our favorite snacks to make involves a generous taste of sweet pumpkin. 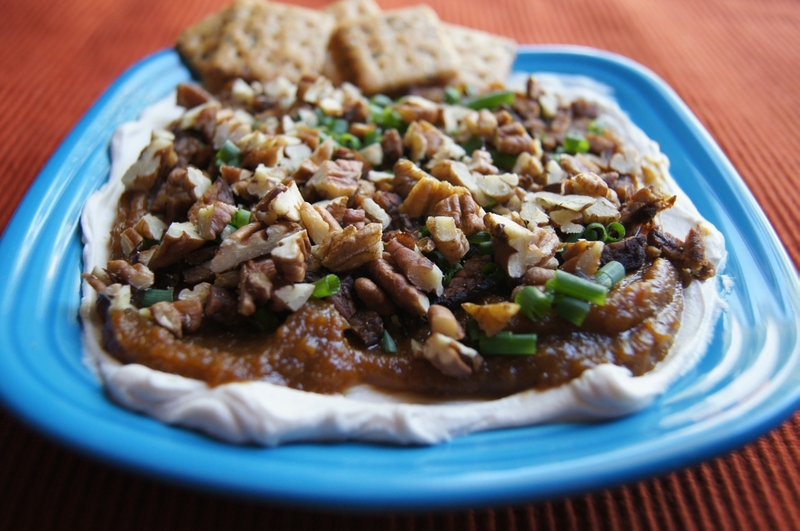 Pumpkin Pecan Dip is a quick munchie that can be made on a whim and will have even the meat eaters asking for more. As with all of the recipes I post don’t skimp on the ingredients with a cheaper version of something thinking you’ll get the same flavor. It doesn’t work. I’ve tried this with different brands of pumpkin spread and vegan cream cheese and the flavors just aren’t there. 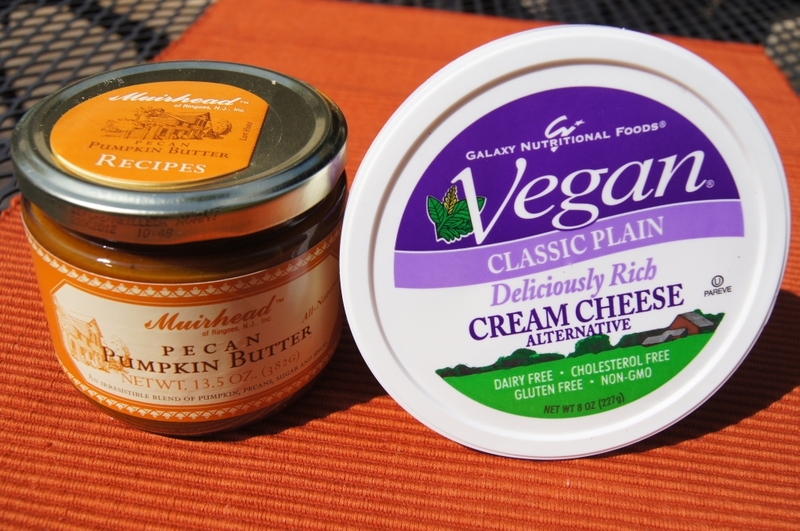 You’ll find the Muirhead Pecan Pumpkin Butter at Williams-Sonoma and Galaxy Nutritional Foods Vegan Plain Cream Cheese is available at most Whole Foods stores. Again, don’t skimp if you want the best flavor. You’ve been warned. Two of the main ingredients: Williams-Sonoma's Muirhead Pecan Pumpkin Butter, Galaxy Nutritional Foods Vegan Plain Cream Cheese and Lightlife Smoky Tempeh Strips (not pictured) are important ingredients in this recipe. Don't skimp on these as they lend the perfect flavor to this dip. I've tried others and they're just not as good. Also, as with most of my recipes, they’re not really hardline recipes. For the most part, I don’t use recipes in my cooking and food preparation. I’m a little of this and little of that food creator. I have developed some of my “this and that creations” into traditional recipes to share and I plan on doing more of that in the future. People keep asking me for recipes of the things I post pictures of on Twitter and I tell them there’s no recipe. Some have said that I’m just not willing to share. No, I say that because I don’t have a recipe for the vegan cornbread that will destroy the milk and egg cornbread your grandmother makes, the vegan biscuits that make those from “that local joint, you know the one” seem like flavorless hockey pucks (they are) or the barbecue tempeh that’s full of perfect flavor all the way through that I like to have once a week. I say that because it’s true. I could write down general guidelines but it wouldn’t be in recipe form. Some of the best things you’ll ever eat will come from a little of this/little of that approach. Damn the recipe! With that said, here’s the….recipe. Toast the pecans until lightly and fry the tempeh strips until crisp. Finely chop both the toasted pecans and tempeh strips, set aside. Spread the Vegan Cream Cheese evenly on a small plate about 1/2 inch thick. Spread the Pecan Pumpkin Butter evenly on top of the vegan cream cheese. Sprinkle the toasted pecans and tempeh strips on top of the pecan pumpkin butter. Top with chopped chives or green onions. Serve with crackers such as wheat thins. I prefer Trader Joe’s Everything Crackers. This time of year every coffee place has their version of a Pumpkin Spice Latte. Starbucks always starts serving theirs early October and Panera has come into the mix this year with their own. Most independent coffee shops I have visited lately have one as well. Some of these are vegan when ordered with soy milk (Panera’s is) and some are not (Starbucks). I have always been partial to making coffee at home. I always know I’ll be served a drinkable cup and it always costs less. I do occasionally enjoy a cup of froo-froo coffee though I typically make a simple syrup with vanilla to falvor my coffee when I want. I did, however, find a more seasonal approach to a fancy coffee at home. I picked up a (few) bottles of Williams Sonoma’s Pumpkin Spice Latte Syrup and have found it to give a perfect flavor, not overpowering and not too sweet like some of the commercial coffee shop’s versions. It is vegan and doesn’t contain any unpronounceable ingredients. In another month, maybe Williams Sonoma will have a peppermint version. 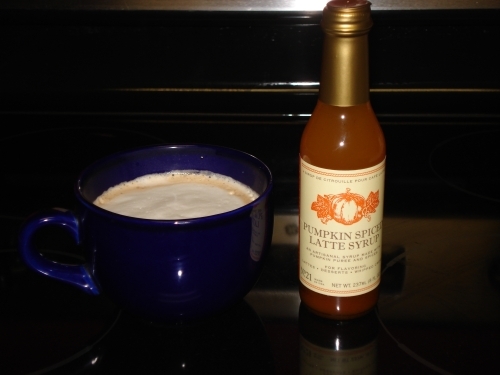 UPDATE: If you’re up for making your own Pumpkin Spice Latte Syrup give this recipe I created a try.